'Into the ground' by Audrey Snyder and Joe Riley, in an early test. Images courtesy of the artists, except where noted. Not many people would think of making a work of public art that evokes a rusty old car, but that is just what Audrey Snyder and Joe Riley, both 2013 graduates of the School of Art, have done. 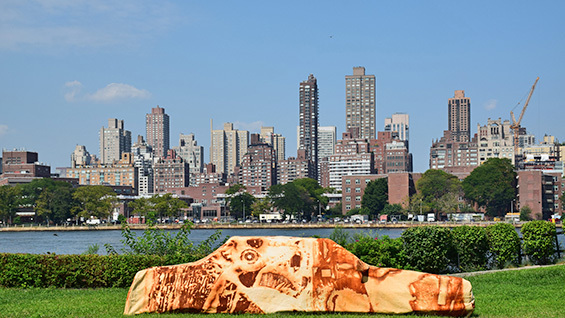 You can see their work, "Into the ground," at Socrates Sculpture Park, in Long Island City, a modestly-sized swath of grass and trees at the edge of the East Channel, across the Northern point of Roosevelt Island. Their work appears as part of The Socrates Annual, a public exhibition that opened this month and will be on view through March of 2019. The exhibition culminates a summer-long on-site Fellowship for 15 artists that includes Snyder and Riley. "Part of the history of Socrates Sculpture Park is that in the 1980s the site was an illegal dumping ground" Riley says, standing next to Snyder in the park on a sunny day while installing the work. "Pictures of the site from that time show abandoned cars, and all sorts of discarded material. With this project, we are trying to pull up some of that material and history, from just below the surface of the park." 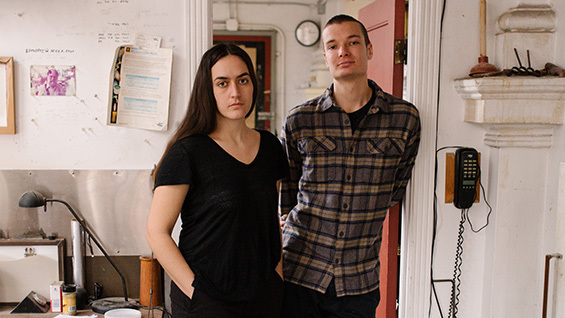 The duo has collaborated since graduating, focusing their practice on examining waste streams through works in public spaces and publicly participatory acts. For "Into the ground" they started with a CAD model of a 1986 Chevrolet Caprice -- "It's a very car-like car" -- a ubiquitous taxi model in New York until the mid-1990s. The artists then built the frame exactly to scale using hollow metal tubing. (Riley's day job is working in the Cooper Union shop, specializing in metal work.) The park provides an open-air studio with lockers and equipment for its Fellows, who also receive a budget for materials. Snyder says they loved the public interaction. 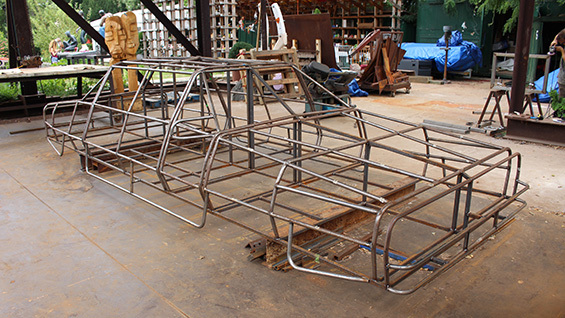 "We would be welding this thing and people would just yell: 'It’s a car!' And we're like, 'Yeah! Good job!' The work is meant to move through stages of recognition, composition, and decomposition. A lot of people have seen us making it and now they'll see it installed here. That was important to us." Their next moves were to solicit public participation in what they called "workshops" that involved collecting metal refuse from the water's edge and elsewhere. Participants then laid the items on a large cotton canvas after wetting it with water and vinegar to accelerate the corrosion process. 24 hours later the iron oxide, long used as a pigment in fine art, had stained the fibers, sometimes in abstract patterns and in other cases creating near-photographic silhouettes. Snyder and Riley then shaped the canvas into a slip-cover for the car frame by hand-stitching pieces together. They hope that over time the metal frame will also stain through the canvas, revealing the hidden structure. "There is a push and pull of visibility and invisibility with this piece. We simultaneously describe and hide the shape of the vehicle by using a cover of castoffs," the artists explain together by picking up where the other leaves off. They drew inspiration from seeing city cars covered to protect them. "Street planning, parking, and traffic in the city gives a high degree of visibility to automobiles. The image of the covered car works in both ways, there’s an explicit obscurity to it. You know it’s a car but you can't see it. The covering is also a protective membrane for constant corrosion and going on beneath. But this process operates 'under cover.' "
The rust, they say, works as, "an object lesson to think through corrosion and ideas of ‘renewal’ in urban space. A dominant view of the ground is either a site for extracting resources, building stuff, burying unwanted stuff. And the automobile, in the American psyche, describes this tenuous relationship to the ground via fossil fuels, petrochemicals, and disposal. " Often Snyder and Riley's work explores cycles of corrosion. "The breaking-down, repair, and corrosion of a car over time can be thought of in terms of the iron inside the vehicle trying to get back into the ground it was once mined from." In fact, those who view the sculpture may look up, gaze across the channel, and observe a newly-constructed Department of Sanitation transfer station on the Upper East Side. The artists see connections between the park and Cooper Union. "They seemed kindred somehow, Cooper and this space," Snyder says. "Each emerged with an art focus in response to a community’s need for service, like public education or public space, that the city did not or would not provide at that specific time." Riley concurs, "Just as free education at Cooper was super empowering for me and so many others, so is this experience at Socrates. Both models are essential for artists yet increasingly and impossibly rare to encounter." And what will become of the car at the end of six months? Riley and Snyder are unsure. It is too big to store in a studio and it would be too expensive to keep in a garage. They say some possible future venues and hosts are "kicking the tires" about perhaps taking it. But, "it could also end up with Adriana Farmiga," the associate dean of the school of art and a 1996 graduate. "She has a yard and a driveway upstate." One wonders if they will let it just go "into the ground."